Home / Blog / London International Food and Craft Beer Expo! This years’ London International Food and Craft Beer Festival was absolutely amazing! Even the rain couldn’t stop the crowds from waiting in line to order one of our foot-long BBQ Sausages served in a freshly baked Polish bun. We loved getting to meet and talk with so many amazing people, and a lot of folks were asking where they could find our products – our Store Locator is the best way to find out what places near you carry our products, but if you have a grocery store or deli counter that you think should be selling our products, feel free to ask them to contact us and we will be glad to talk to them, too! 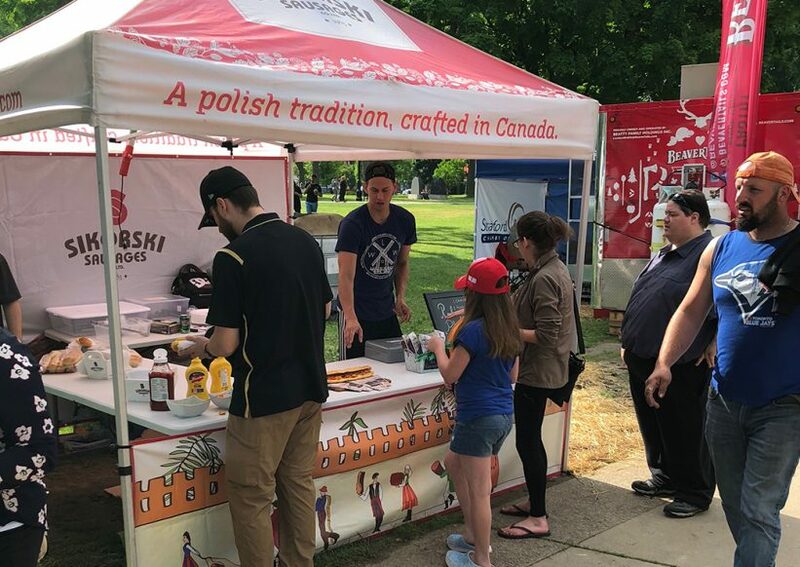 It was great getting to meet so many of our fans and friends here in the London, ON area: if you are wondering where to see our tent next this busy festival season, we will be spending July 6-8 at the Chatham-Kent Ribfest! We’re looking forward to seeing you there and showing off even more of our delicious new flavors of BBQ Sausages!